A collaboration between Christopher Alvarado and Thomas Park, aka Mystified, exploring the theme of the world’s greatest urban landscapes. Download the whole album as a zip file or click here for more downloading and streaming options (flac & mp3 available). 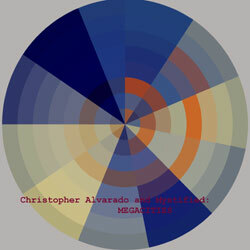 Christopher Alvarado, upon request, remixed sounds furnished by Mystified and made a set of nice, cold urban anthems. He and mystified agreed to theme the release “Megacities”, after the world’s largest population centers. Many sounds were taken from Mystified’s “Amalgam” netrelease. Composing by Christopher Alvarado, some sounds and mastering (and cover design) by Thomas of Mystified. More about mystified at their homepage.